This bed and breakfast, one hour outside New Orleans, felt like a home away from home. Sally and Leland, the proprietors, fed us each morning with a huge, delicious breakfast and filled us up with local and personal history. We got a real taste of Cajun food and lore. 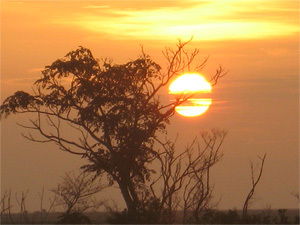 They were warm, funny and took such a personal interest in our trip. The room had THE most comfortable king size bed with down and the softest sheets. We had a fridge and stove, the room was cleaned daily and we swam in their salt water pool to our hearts content. 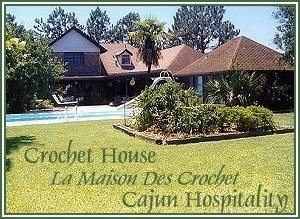 If you are looking for a comfy, authentic Louisiana experience go to Crochet House! I was looking for stuff on the net and found I still had your website on my list of favorites. And "favorites" is really an appropriate word for your home. Rodney and I had a wonderful time as guests in your beautiful home. The studio room was much more than we had anticipated. We really appreciated having the room to move around comfortably AND a washer and dryer. It was just so charming. Thank you for being so gracious as to feed us on Christmas night. Can we come for dinner every year? We'll sit at the kids table, huh please?!?!? I still can taste the chicken and oyster gumbo! And that sauce for the scrambled eggs! It was all I could do not to just bring the bowl over to my side and dig in with a spoon. My hairdresser is going to take a culinary vacation where she gets two weeks of intensive cooking. I think she should stay at your place and watch you cook, she'd probably learn more from you than some professional chef. I'm going to nag Rodney until he makes me some gumbo. You should think of printing up some of your recipes in a book for your guests. I'd buy one. Again, we have the best time staying in your home, learning about the Cajun culture from you, and enjoying your great cooking and wonderful hospitality. Au Revoir until we meet again. Albert and I find an ordinary Thank You inadequate for the Wonderful four days we spent at your Crochet House. If you only knew how much it meant to us. Thanks to you we have such special memories. Your Crochet house is not only beautiful but your wonderful delicious breakfasts keep coming to mind, and the most comfortable beds I have ever slept in. Your kindness and generosity comes once in a life time and we thank you both from the bottom or our hearts. With Warm Regards to two Beautiful New Friends in our lives. Just a short e-mail to inform you that we've made it safe back home. Now we're both going to work for about two weeks. We want to thank you again for the very pleasant time and hospitality we received during our stay at your home. It was certainly one of the highlights of our vacation. After leaving ,we went to one of the old plantage houses (Laura's) at the Mississippi river. very interesting! After having visited the Gulf coast we went up to Nashville where we had a wonderful time. Finally we went back to Memphis, visited Graceland and cached our flight back home to Amsterdam. Leland how's your playing on the accordion? Next time we want to hear you playing at the museum! Best regards, and may be we'll see you once again.